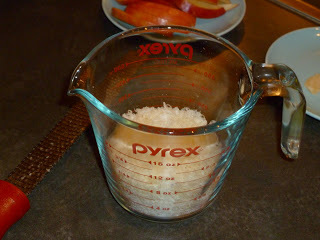 1) Using a microplane, zest the cheese into a measuring cup until you have one, fluffy mass. 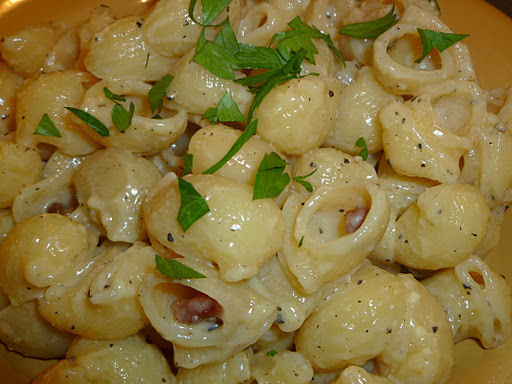 In a bowl beat eggs, add a few cracks of pepper and about 2 tablespoon of Parmegiano-Reggiano; set aside. 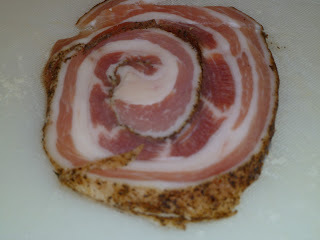 2) Dice raw pancetta and chop parsley, keeping them separate. 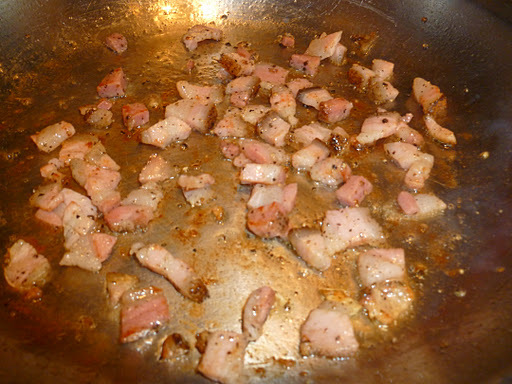 3) Heat oil in a skillet until it just begins to ripple in the pan, then add pancetta and cook about 4 minutes, until browned. If pancetta does not already have pepper infused into the meat, add a few cracks of pepper while sautéing. Set aside, in a small bowl, without drippings. 5) When the pasta is just about cooked, take a measuring cup of mug and scoop about 1/4cup of the pasta water, once it’s al’dente dump the majority of pasta into a strainer, allowing a small amount of pasta water to remain in the pot. Pour pasta back into the pot and take off the hot burner. 6) Mix in the beaten egg mixture, stirring constantly. Add the cheese and a 1 teaspoon of pepper; continue to stir until the pasta sauce thickens (this will take about 3 minutes). Taste and add more pepper if necessary. If the pasta seems dry, add a little of the reserved pasta water and stir until the pasta seems slightly sticky, cheesy and well coated with sauce. 7) Distribute to 4 serving plates, zest a little more parmesan and a sprinkle of parsley. I’m sitting back and looking across an expansive and happy belly. The Carbonara was fantastic and so easy. I had to substitute bacon but it was still wonderful. I also deglazed the pan I fried the bacon in with the pasta water before I added the egg mixture and parmesan. The fact that I didn’t screw this up is a testimony to the easiness of the recipe. It was so good! Thank you Christina! Now for some yoga…I’m thinking about 8 hours in Savasana.